We stayed at The Lookout at Cranes Landing for the second time in a year. The house is very comfortable and has a great view. The kitchen is fully stocked with pots, pans, and equipment, so we enjoyed cooking and baking. My granddaughter and I love the Fisher-Price doll house. We loved exploring beautiful Whidbey Island. Amazing views! Clean, well equipped and labeled with everything guests need! Great experience all around. Thank you for your comments. We are so happy you had a "great experience" visiting and staying on Whidbey Island. We hope we can help you with your next stay on the Island. The absolute cutest cottage! Clean and WELL stocked.... we didnt lack for anything. The younger kids LOVED the toys upstairs and there were plenty of family games. There were 2 adults and 4 children, would definitely come back again. Thank you for your comments. He are so happy you enjoyed your stay in the "absolute cutest" home on Whdibey Island. We are glad you want to come back and we hope to help with your next stay on the Island. We were lucky enough to stay during a snow storm. Beautiful snowy sunrise view! House is well maintained We loved the view from the hot tub! Thank you for your comments. We are so happy that you had an enjoyable stay Whidbey Island. We hope we can help you with your next stay on the Island. We've already decided that we are booking again for next year. The house is approx 30 minutes from the ferry. Kitchen is well stocked with every dish, pan, utensil that you need. We watched the eclipse from the hot tub. AHMAZING! We watched movies (extensive DVD collection) and scrapbooked all weekend. We drank our morning coffee on the swing on the front porch. The views are incredible. We love this house. It was our second time staying there. We can't wait for next year. Thank you for your comments. We are so happy that you loved and had an "AMAZING" stay at Cranes Landing. We will happy to help you with your next stay on the Island. The house and location is beautiful. You cant beat the view from the hot tub! A true 5 star property. We can't wait to go back. Thank you for your comments. We are so happy you enjoyed the accommodations and loved the view from the hot tub. We hope we can help you with your next stay on the Island. Perfect house for a great get away! This house was so cute, clean and charming! Spent a few days here for some R&R and it did not disappoint. House had everything we needed, kitchen was well stocked with plates, cookware, etc. Beds were comfortable and the selection of DVDs and games were awesome for our kids. Ideal location to walk to the shore and explore. We loved it!! Thank you for your comments. We are so glad you "loved" your stay on Whidbey Island. We are glad you found "everything" you needed and the home was "ideal" for your needs and expectations. I’ve rented many, many vacation homes and this was one of the best. It’s a beautiful house - inside and out. Absolutely spotless. Beautifully furnished and the kitchen was the most well-stocked I have ever seen. In addition, the rental company is super responsive and helpful. Wonderful location. Quiet. Gorgeous view of the water. Grab it!! Thank you for you comments. We are so happy that your stay exceeded your expectations and your home your stayed in was 'one of the best" you have been in. We hope we can help you with your next stay on Whidbey Island. This lovely home was perfect for 5 adults and a 2-year old. Everything was clean and new. It had everything we needed for cooking. We liked having a beach within walking distance. We saw orcas and a bald eagle! Thank you for your comments. We are happy they home you stayed at was "perfect" for your needs on Whidbey Island. We hope to help you with your next stay on the Island. Thank you for your comments. We are happy you had an "awesome, wonderful" stay on Whidbey Island. We hope we can help you with your next stay on the Island. We really loved the place very much. The whole house was very well set up with everything anyone in a home would need .Very clean and tidy. Each drawer and boxes labelled in the kitchen and bathroom and extra stuff in the laundry room. An extra small fridge with things like jam and ketchup for the guests to use. Bathrooms had supplies in case you forget simple things like toothpaste etc. Hot tub was amazing with a wonderful view of the water. Garden very nice and even a small herb garden for the guests to use . One bedroom upstairs was perfect for kids with lots of toys and even an Xbox and games. We would recommend this place to anyone in a heartbeat. Thank you for your comments. We are so happy you "loved" your stay on Whidbey Island. We hope we can help you with your next stay on the Island. We had a wonderful stay for 4 adults and 3 children. The house is well-maintained, new and clean. The hot tub worked great. There is a fantastic kids room with its own tv and seating area. It's like they have their own apartment. There is a doll house and lots of fun toys and duplos. -The grill doesn't heat up well enough, so don't really count on doing a great grill out. -The beach is in walking distance but down a steep hill. Was not great for small children or grandparents, but there is a little parking area at the bottom of the hill. It isn't the type of place where you can just watch kids play on the beach from the porch. The beach is rocky and full of shells. At low tide it is interesting, but the water is way out and sand is muddy. Just so you know what kind of beach it is. It is a quiet area with hardly anyone else there. Thank you for your comments. We are happy you had a "wonderful stay" on Whidbey Island with your family. We hope to help you with your next stay on the Island. OMGoodness. The best rental house we have ever had. Perfect. This rental had everything and more! Amenities, Location, Layout were all beyond expectation. Clean and superbly maintained. Highly recommend this house. We enjoyed a whale watching boat tour, yes we saw humpbacks, orcas, and minke whales, seals and porpoise and more, Deception Pass, Local restaurants, Local wineries, Local distillery, local loganberry pies. We loved the swing on the porch, the hot tub, the deer, the bald eagles, the birds, the view was amazing. Can't say enough how much we loved this house and location. THANKS for sharing your house with us. Thank you for your comments. We are so happy your stay was so enjoyable and "perfect". Please let us know when we can assist you with your next stay on Whidbey Island. We traveled to the PNW for the first time with college friends from the Midwest. We both have toddlers and were anxious to find a rental that would accommodate. Tara Property provided high chairs, pack and plays for sleeping, and the house had plenty of toys and games (for the kids and adults). Whidbey was spectacular, and the rental house was grand. The house proved worthy of the "lookout" title as well. We saw tons of wildlife- deer, bald eagles, harbor seals, and even a gray whale right at the beach! Thank you for your review. We are happy to hear you had a great time with friends. There is lots to do on Whidbey Island so thanks for coming to our beautiful island in the NW. We stayed in this rental for 5 days for a couples vacation. It is absolutely gorgeous and everything we could have needed was available (except wifi didn't work this was not issue for my husband and I). The views are amazing, we even saw some wild life including and eagle and a few harbor porpoises. I would recommend staying here, especially if you are looking for a peaceful retreat out of the city. Thank you for your review! We're happy to hear you had a great time on Whidbey Island with friends. My wife, son, his wife and three children had a perfect stay at this lovely property. It exceeded our expectations. We even got to watch grey whales from the front porch. The house is new, very clean and the appliances are all modern. The views are spectacular. Thank you for your review. We are happy to hear you loved this vacation home. Our number one goal is to have all of our homes clean and inviting. Nice to hear you got to see some whales. Words cannot describe how perfect Cranes Landing was! The home was beautiful, sparkling clean, and the views were perfect. Every little detail was there- fresh coffee beans, shampoo and soap in all the showers. Extra toothbrushes, baking supplies, comfy throws in every room! The views were breathtaking and we didn't want to leave!!!!! We will be back! Thank you for your review! We are happy to hear you had a great time on Whidbey Island. Nice to hear you want to return to our beautiful island. We came for a three night visit with four adults and four children. The house was a perfect layout for two families and it was beautiful. Though the temps were in the low 30’s, the porch swing and the hot tub were in full use. We had amazing sunrises and a great overall experience. The beach is a short walk downhill and full of fun for the shell/rock/crab hunters. I would highly recommend this home. My only feedback for the owners/mgmt would be towels. There were only two dish towels and for 8 of us, only 10 bath towels available to cover bathing and the hot tub. They were also very well loved towels and had bleaching stains, which isn’t a deal killer, but if you are paying a premium price for a home it would seem a small cost to have plush newer towels. thank you for your comments. We are happy this was the "perfect layout for your two families. We hope to help you with your next stay on Whidbey Island. Best rental I have ever rented! House is well supplied we didn’t really need to bring anything,which is a nice change from most rentals.Beds very comfortable,kitchen is well supplied,living areas are very comfortable! !great views! Thank you for your comments. We are so happy that you found the "best rental you ever had". We are glad we were able to help you with and enjoyable time and hope we can help you with your next stay on Whidbey Island. We had an AMAZING weekend at the house on Cranes Landing. The house was absolutely beautiful. The kitchen had everything that was needed and more. The hot tub was awesome!! On the last night, we discovered that there are some really cool lights in the hot tub. They have quite the movie collection. We played Jenga and Taboo. We shopped in Langley. Took a cab to dinner at Gordon's which was incredible. Walked down on the beach. The house was large yet cozy. The beds were comfy. The views were stunning. We will definitely be back!! Thank you for your comments. We are glad you had an "AMAZING weekend" at Cranes Landing. We are happy you are planning your next stay on the Island and hope we can help you with another "AMAZING" stay. This home was perfect for both staying in and adventuring across the island. The house had plenty of room for our group of 5 adults, but still felt cozy. We love to cook and this house was fully stocked with every kitchen tool needed. Beds and linens were also very comfortable. The weather was beautiful for December with beautiful sunrises each morning. One caution, the steep driveway was slick at night and in the morning due to temperatures, so we had to plan accordingly. Places we visited and enjoyed included Deception Pass, Fort Casey, South Whidbey State Park, Spoiled Dog Winery, and the Oystercatcher. And you must visit Whidbey Pies Café around the corner at the Greenbank Farm. We had a few questions/comments during our staying and the Tara Property Management was very responsive! We would highly recommend this property and hope to make a trip out to stay again! Thank you for your comments. We are happy your stay was "perfect". 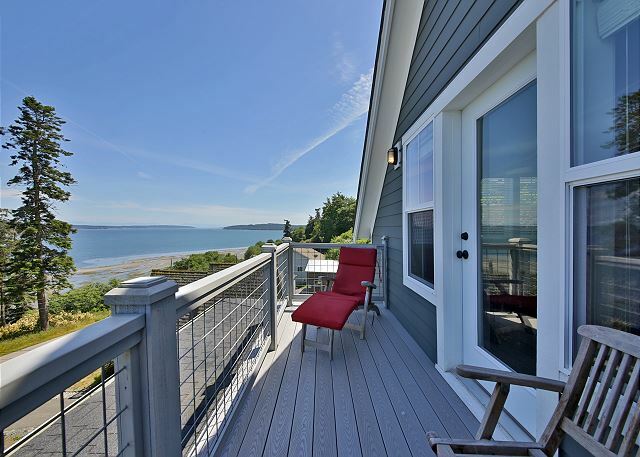 We hope we can help you with your next"perfect" stay on Whidbey Island. Wonderful weekend with some girlfriends! We were comfy and cozy all weekend in this luxurious home. We had everything we needed and spent most of our time indoors playing games, cooking food and watching movies. We had access to everything we needed and were grateful for the cozy space. Thank you for your comments. We are happy you had a "comfy and cozy" stay on Whidbey Island. We hope to help with your next stay on the Island. Our family enjoyed a relaxing weekend of games, football and food at The Lookout at Cranes Landing. The kitchen is lovely to create amazing meals in. Dining table is big enough to seat all that can sleep in the house! Comfortable gathering area around the fire and TV. The house was impeccable and the response to one minor problem on Thanksgiving Day was outstanding. 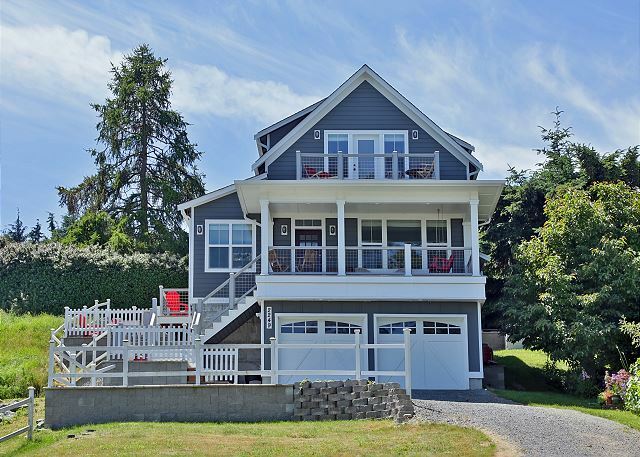 Centrally located on the island so just a short drive to Coupeville or Langley. We enjoyed the hot tub and could see how it would be great for a get away in warmer weather. Thank you for your comments. We are happy you "enjoyed a relaxing weekend" on Whdibey Island. We hope we can help you with your next stay on the Island. My wife and I, along with our two kids (7 and 4) have certainly explored a lot of vacation options, both with hotels and rentals. The Lookout at Cranes Landing takes the cake! We actually thought about not writing this review because we just want to keep it for ourselves. It was just the 4 of us, but you could easily make it work with 2 families. The kitchen was abundantly appointed, the decks are serene with views, and the kids bedroom is equipped with double queens in a day bed setting. The hot tub is nice and we were in it every day. 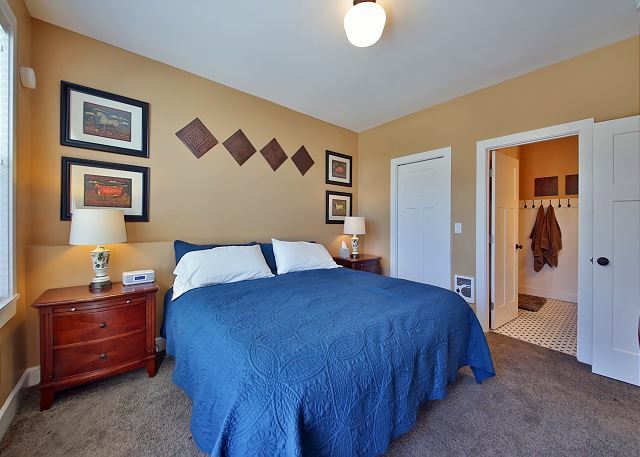 The property description was very accurate, everything was clean, the owner was prompt and friendly, neighboring Coupeville and Langley are less than 15 minutes north and south of the home, respectively, and we certainly plan to return. Thank you for your comments. We are happy you had a great stay on Whidbey Island, we are glad you want to come back and hope to help you with your next stay on the Island. This property is a beautiful home in a great location! Overlooks the water and has an abundance of wildlife; multiple eagles to watch. All modern amenities and convenient with supplies and the necessities. It's near and has access to a secluded beach - A lovely walk. Overall a great vacation spot that is remote & quiet. Thank you for your comments. We are happy that you enjoyed your stay on Whidbey Island. Please let us know when you want to return to the Island and hopefully we can help you with your stay. We've stayed here 2 different times for 5 days each time, and as we were leaving this time a couple members of our group said wistfully that they wondered if we could rent it for a whole month sometime! It's that nice, you just don't want to leave. The space is welcoming, clean, and extremely well supplied. Anything you could want to cook, they have provided the necessary tools to do it, plus an impressive array of spices and other cooking "accessories". Tons of movies to watch, the beds are comfy, the hot tub is wonderful. And the view...a month here sounds better all the time! Thank you for your comments. We are so happy that you had an enjoyable stay on Whidbey Island. We hope we can help you with your next stay making it 3 times! Thank you for your review! We are happy you enjoyed your stay and hope you can return again! This is a beautiful, very well-maintained home with spectacular views from every room. 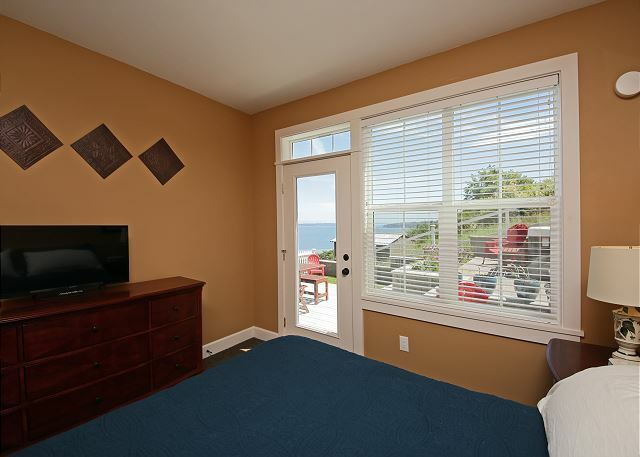 It was tastefully furnished with all the amenities needed to relax and enjoy Whidbey Island. The rental was thoughtfully stocked with all the items and supplies needed to get our stay off to a great start. It's in a quiet neighborhood and a short drive to stores and services. Thank you for your comments. We are happy that you thoroughly enjoyed your stay, we hope we can help you with your next stay on Whidbey Island. We loved the open feeling of the home. The kitchen was great to cook family meals, and we enjoyed using the patio to have dinner in the evenings. The home is a close walk to a community beach. We saw deer almost every morning walking through the neighborhood. Thank you for your comments. We are happy you "enjoyed' your stay on Whidbey Island, we hope to help your with your next vacation on the Island. We stayed here with our daughter. Excellent accommodations: clean, gracious, well designed. Thank you for your comments. We are happy that you found they accommodations "excellent". We hope to help you with your next vacation on Whidbey Island. This is a fantastic home. It was perfect for my birthday weekend! Stunning, well appointed, great views and outside space. Thank you for your comments. We are happy that the weekend was "perfect". We hope to help you with your future vacation needs on Whidbey Island. 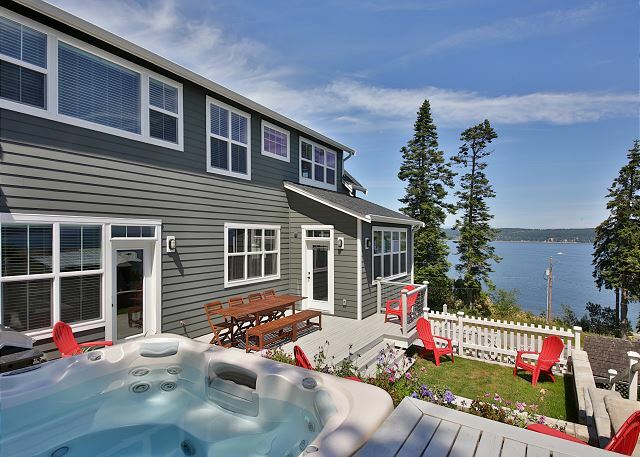 We had an absolutely wonderful time on Pugent Sound in this gorgeous and fully equipped rental home. The house was situated close to everything we wanted to do (hiking, kayaking, sightseeing) and was equipped with anything and everything we could ever think of. Tara Vacation Rentals were very efficient and kind throughout the entire process. Definitely worth staying here!! Thank you for your review, you feedback is important to us! Our family loved staying at this lovely home. We had fun putting together a jigsaw puzzle, playing Jenga, watching the eagles on the beach and deer in the front yard, grilling hot dogs and enjoying the hot tub. The house and view are beautiful! Thank you for review, your feedback was appreciated. We look forward to your return to Whidbey Island! The home was extremely nice and incredibly well stocked with dishes, wine glasses, utensils, even spices, coffee and assorted teas. We were in awe of the beautiful view of sound and Mt. Rainier. We didn't use the hot tub but it was there if we wanted to. Seven women gather this time of year every year for the past 20 years and I will think this was the best house ever, and if we didn't go someplace different e wet year we would re-rent this wonderful property. We are so glad that the home was stocked to your satisfaction and that you enjoyed the house! We hope you'll come stay with us again! Thanks for your review. It was awesome! Incredible views, wonderful house - everything we needed! So glad you had a great time and that you had everything you needed. Thanks for your review! Tara Vacation Rental was wonderful to deal with!! Very responsive and customer service oriented. We hope to go back again to the Lookout at Cranes Landing and look forward to working with Tara Rentals. Loved walking on the beach down the hill and playing games at the big table while enjoying the amazing view. THANKS!!! We are so glad that you were satisfied with your trip and with our service. We look forward to working with you again! Thank you for your review! We had a perfect getaway weekend with the girls. Everything was just right. Comfortable cozy beds. Clean Fresh and new. Bright and light through the whole house. We had beautiful weather but it would have been just lovely had it rained all weekend. Kitchen was a cooks delight everything you needed and plenty of counter space to prepare. Just can not think of anything that wasn't just right. The little towns close by had delicious food and shopping. The setting and ocean views were outstanding. We are so thrilled that you so thoroughly enjoyed the home and the location. Come back soon! Thank you for your review! Thank you for your review! We're so glad that the house had everything you needed and that you enjoyed the views! We had such an amazing getaway at this house. It is beautiful. Such a well made home with everything you can ask for. We went to Whidbey to get married at the courthouse and stayed here with my daughter and her boyfriend and my sister. The hot tub was superb and a baby deer came out to greet me in the afternoon. It's an exceptional property and a great family memory that I will forever cherish. We're so glad that you had such a memorable experience at this property. Thank you for your review! Come back soon! Top to bottom, inside and out, this house is amazing. It's super clean and well maintained; the quality of everything from kitchen equipment to towels to electronics to mattresses is very high. We were pleasantly surprised to find that the kitchen was so fully stocked with spices and condiments, and even some extra goodies that we were welcome to use (brownie mix, popcorn, coffee beans). The yard is nicely maintained and the hot tub was marvelous. The beds were comfortable; the bathrooms were even stocked with hand and bath soap, shampoo and conditioner, q-tips and cotton balls! The owner really goes the extra mile to make your stay comfortable. There's an excellent selection of blu-ray movies for all ages and tastes and wi-fi is included; unfortunately, only a couple of us were able to get cell service right at the house, it seems to be largely a dead zone in that regard, but it was nice to unplug so we didn't mind too much. Lots of room to spread out or go off on your own if you want to. The hot tub was a nice luxury and has the same marvelous view as the living room. We will be back for sure! Thank you so much for your review! We really appreciate all of the detail included in your comments--we're so glad that you so thoroughly enjoyed the home! We hope you'll come stay with us again soon! We enjoyed our stay tremendously. Home was beautiful, clean and updated. Wonderful views. Hot top was great on those cooler evenings. Nice to hear you had a great stay on Whidbey Island. We try hard to have our homes inviting and clean for our guests. Glad to hear you loved the hot tub. beautiful house! 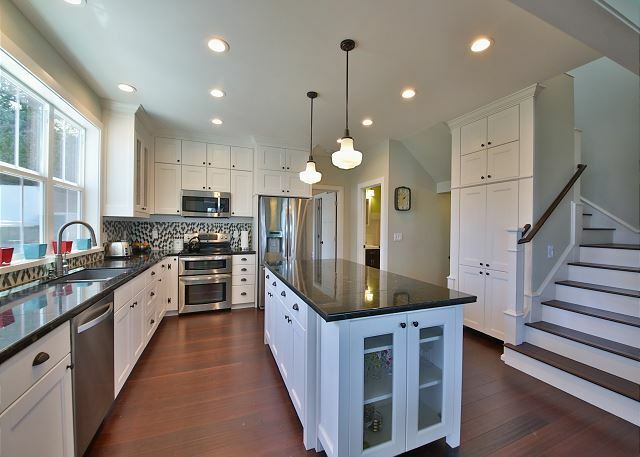 Open kitchen and a great location to relax and unplug for a couple days. Hot tub was a big perk and loved that view! Thank you so much for your review. We're happy to hear you had a great time and loved the views. The house is gorgeous with great views from every window. The hot tub was fantastic. Everything was clean and well maintained. We had a problem with the heater when we arrived and the management company really made it right. I can't wait to go back. Glad to hear you had a great time and loved the views. 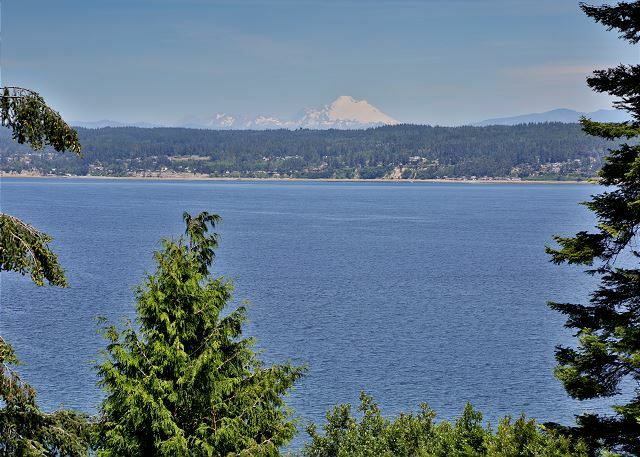 We have some fabulous views on Whidbey Island. Thank you for your review. Myself and 6 other girl friends had the best time!!! it provided us everything we needed and more for our weekend getaway. WOW! Sounds like you had a great time with friends and lots of laughs and relaxation. Thanks for your review. We were a group of 7 women celebrating a friends 50th birthday. We couldn't have loved this space more. The home is spacious, the view beautiful, the beds comfortable and the hot tub hot! It was in imaculate condition and the owners have provided so many lovely touches. We appreciated the many cosy blankets, fresh coffee and general attention to detail. We would definitely recommend to a friend. Thank you for your review. We are glad to hear you and all your friends had a great time. 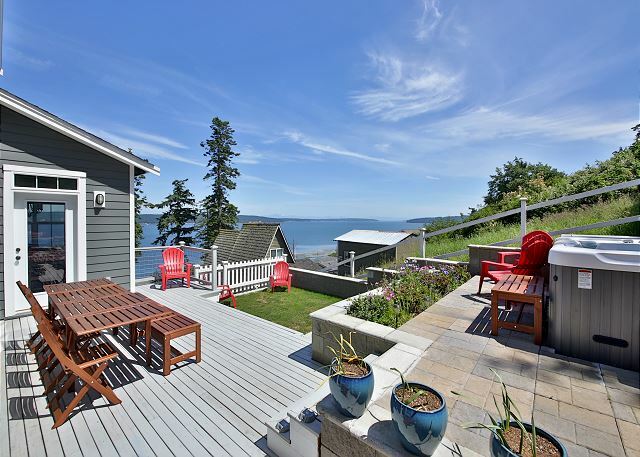 We love our views on Whidbey Island. We traveled from the east coast to celebrate a family birthday on Whidbey Island. It was our first experience on the island. Seven adults and one infant shared a week together in this house. Turned out to be an excellent choice. It was well supplied. Great location. Hot tub was very enjoyable. Kitchen very nice for cooking in instead of going out, but good location for eating out as well. Driveway is STEEP. Would stay here again. So glad to hear you had a great time with family. We have several restaurants on the south end of Whidbey Island, however eating a home cooked meal while enjoying views of Whidbey Island. Thank you for your review. My sister and I rented this house for a long holiday weekend. 4 adults and 4 kids. The kitchen was above and beyond and had plenty of dishes, pots, pans, utensils and glasses. Games and a puzzle! We had a movie night. Relaxed in the hot tub. The beds were really comfy. Loved this place. My only stress was when we had dinner and the condensation from the glasses left white rings on the dining room table! I was so worried about ruining their table! Fortunately the white rings disappeared after a few hours. I used the placemats I found in a drawer from then on. Would definitely return! Lovely home. Nice to hear you had a great time and loved this home. Thanks for your review. I highly recommend this property for a weekend getaway. It has all of the modern luxuries (fireplace) in a tranquil setting. There's nothing quite like waking up to this view each morning. Glad to hear you enjoyed your visit to Whidbey Island and had a great getaway weekend. Thanks for your review. We found tea, coffee and cocoa, spices, butter, cooking oil; all the things you need to take full advantage of a kitchen like that. Shampoos, soap, cleaning supplies; so much was provided and high quality. The most recent rental I stayed at prior to Cranes landing had actually watered down all of the liquid soaps, nothing like that going on here. The views are stunning, there’s a pretty good dvd library, plus wireless connectivity and Netflix on the blue-ray. We curled up on that giant couch with those super comfy blankets and turned on the fire, it was soooo relaxing! Since we were there during “Stormageddon 2016” we didn’t make our way into the hot tub, but next time we definitely will. This is a very special place, we felt spoiled. We definitely plan on coming back here again for R & R.
Thank you so much for your review! We are so happy to hear you all had a great relaxing time and enjoyed this beautiful home. WOW! Great place to stay! Way better than any picture could capture. This house is straight out of a magazine. So beautifully decorated and perfectly outfitted. Not a thing we wanted or needed that wasn't provided, from plastic ware for the awesome hot tub to comfy blankets to curl up by the fireplace. And the beds! So wonderful - slept well with windows open to the water. Location was in middle of island with easy access to anywhere. Very close to Whidbey Pies (get the loganberry) and the Cheese Store! Views were spectacular. You won't find a better place to stay. We are so happy you loved your stay on Whidbey Island. There are a lot of fun things to do and see. Nice to hear you loved the home you stayed in. Thank you for your review! s in the downstairs bathrooms tripped and we weren't able to reset not so good getting ready for the wedding. we had a great time! very comfortable my wife would love to come back rent again. Thank you for your review. Glad to hear the weather was great for your visit and you had a great time on Whidbey Island. We love this place. So easy and clean and relaxing and perfect for our two families. Our kids had a blast. Parents got to chill. Explored the amazing beaches around Whidbey. We will be coming back for sure! We are so happy to hear you loved your visit to Whidbey Island and will be back. Our beaches are beautiful here. Thanks for your review. The house is beautiful:well equipped and well thought out for guests. The views are spectacular. Almost everything worked as specified and the amenities such as the hot tub were terrific. However, the unpaved gravel/ski jump driveway was a major hassle (we couldn't drive up to the house without being shown; so we had to unload car from bottom of needs to be paved!! !Upstairs bathroom fan didn't work,no umbrella for shade to eat outdoors, grill needs attention(right burner) no dish rack. Garbage pick up is on Thursday not Wednesday and bins put outside Tuesday night as directed were opened by animals. Other than these problems we loved the house and would stay there again if circumstances permitted. Thank you for your review! The owners are having the driveway paved soon. Also, sorry about the garbage mix up, we are checking into that as far as signage. We are happy to hear you loved the home and your stay on Whidbey Island. For future guests, please feel free to contact our office and we will help to make your stay a good one. We recently returned from our Whitby Island trip and had a wonderful stay at this charming and very well appointed house. This is our third time using VRBO and once again expectations were exceeded. Great location, amazing scenery and what a gorgeous house. Thanks! We will be back. We are so glad that you enjoyed the property and your stay. Thank you for your review! - The rental agents were polite and responsive, even after I paid! - The home sits on a steep driveway and has about 10 stairs up to the door if that matters to your party (it was doable in this case). - Although the home is modern, it provided what we wanted from an old-fashioned island getaway, as it's located on a rural road away from the major towns and perches above the trees and water. - We took easy day trips to Langley (recommend the patio at the Flower House Café) and Coupeville (thumbs up to the Farmer’s Market). - The water is a healthy walk away, downhill on a paved road, and the beach is rather narrow and rocky. Still, quiet, picturesque and worth the stroll. - The hot tub is clean and pleasant and worth the $45 extra to soak outside, enjoy the view and starry night. - Be sure take a few moments to take in the scenery from the upper balcony, you will feel on top of the world. Thank you so much for your specific and helpful comments. We're so glad you enjoyed the layout of the home and the amenities offered. 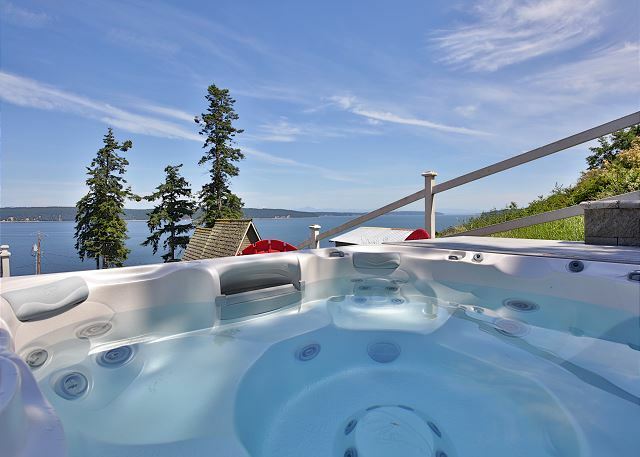 We're happy that the location was suited to your needs and that you enjoyed the hot tub, the views, and the beach access. Thanks again for your review! The Lookout at Cranes Landing was the PERFECT rental for my 30th Birthday and 4th of July Weekend. The beach is only a short walk down the hill, the grill and hottub were excellent additions and the beds were VERY comfortable. The owners were very on top of responding to any questions we had and everything was in perfect condition. I would highly recommend The Lookout at Cranes Landing to anyone looking for an island getaway. I will be booking this again next year if its available! We're so glad that you enjoyed your stay! Thank you for your review!